I asked the team to bring the updated plans. I just had the kitchen elevations in hard copy. Nothing else. “Elevations” is part of my new vocabulary. See how I just threw that out there, as if it wasn’t a term that I learned three weeks ago? It’s amazing how quickly you can assimilate new language. For those of you not fluent in whale, in this context, elevations are the wall view of the plans, versus the flyover view. The elevations show the relative height of the cabinets, where the tops of the windows line up and how the microwave stacks over the wall oven. I don’t know the name of the top-down plans. Floor plans? I think that’s right. I did have some of the drawings electronically. I like them that way because I can pull them up on my phone, tablet and laptop. I can zoom in on specific features. I don’t like the pixelated versions in that I have a hard time getting the overall and relative picture. So I requested the printouts. The printed plans are oversized. You can run your finger along the outside wall, rather than hiding half of the room behind a stubby digit. You can trace the new door opening while standing in the as-is room and squinting to see the future. You can hold the page an arm’s length away, below where the new wall of windows will be, and still make out the details in the drawing and pretend your other hand is resting on the new kitchen island. My printer can’t print to that size of paper. The architect’s printer can. They printed out everything that was updated, and there were bonus pages. There were drawings with circles with little points–some with the points exiting one side and some with the points spread around the circle like a compass. The circles were linked together with bowed lines. These were the electrical drawings. There was a color-coded set with red numbers and green numbers that corresponded to the color of the kitchen cabinets. There was a framing plan that was unfathomable to me. These documents made me very happy that I hired someone who understands them. There were also two pages that had the current floor plan. This was awesome because they lined up with the to-be plans so I could get a better relative idea the changes. On closer inspection, it dawned on me that the as-is plans are not there for my comparative pleasure. I saw shaded areas that, according to the legend, are areas marked for demolition. Whoa! Demolition. That’s a serious word. The shady spots are along a few walls where doors or closets are moving. There’s a few spots where the floor is coming up and being replaced by tile. And there’s the back three-quarters of the house marked for wrecking. 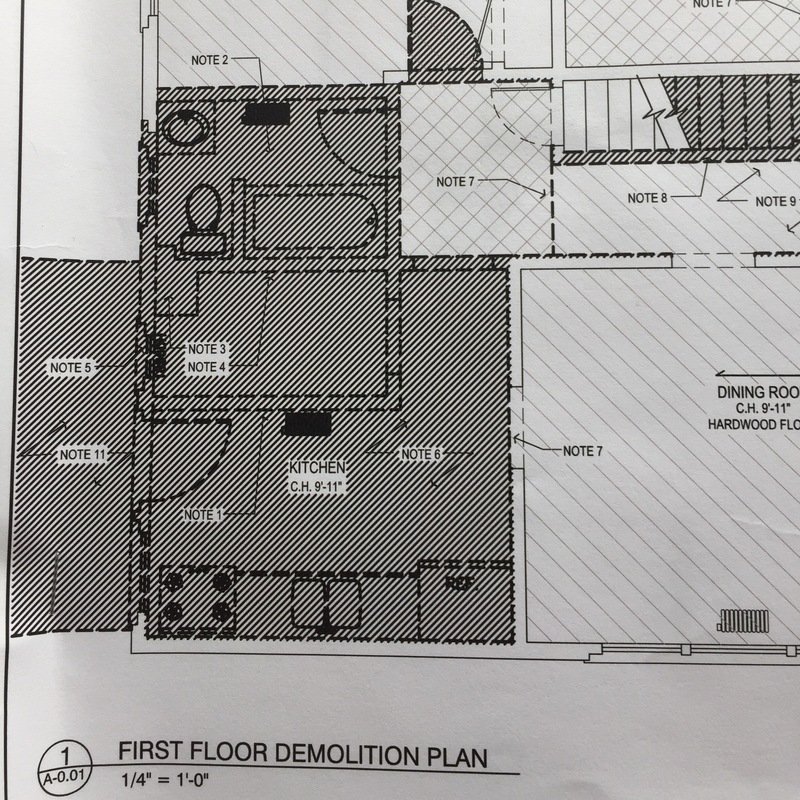 The kitchen, the pantry and the bathroom, and the wall that encases the stairway–all with X’s marking the spots where they will be razed and remade. And reused and recycled, too. There are a bunch of notes in the margin instructing the contractors to carefully remove and replace boards and trim. I like that demolition and destruction are on the same page as care and reclamation. I like the contradiction and the compliment, the yin yang of it all. I’m finding meaning in everything.